With great fanfare and a claim that “Canada is back,” Prime Minister Trudeau helped usher in the Paris Agreement on climate change in December 2015. Since then, however, the federal government has pushed to expand fossil fuel production through new bitumen pipelines and LNG terminals. This contradiction points to a loophole in the Paris Agreement, one that perfectly fits Canada: countries have committed to reducing emissions within their borders, but not the carbon that is extracted and burned elsewhere. If we look at what we dig, not just what we burn within our borders, there has been a relentless rise in carbon emissions. Paris poses no limits or sanctions on the supply of fossil fuels being brought to market by producing countries. For exporters like Canada only the emissions from getting fossil fuels out of the ground and to the border are counted. As a result, producing countries have a powerful incentive to respond to the Paris Agreement by doubling down on fossil fuels now before their value evaporates. This “green paradox” is bad news for the climate. The amount of fossil fuels burned for energy use in Canada has remained relatively flat since 2000. This is because emission increases in Alberta from the oil sands have largely been offset by reductions in Ontario and the Maritimes from the phase-out of coal-fired electricity generation. But if we look instead at what we dig, not just what we burn within our borders, there has been a relentless rise in carbon emissions. Extracted carbon—the amount of fossil fuel removed from Canadian soil that ends up in the atmosphere as carbon dioxide—has grown dramatically. These emissions totalled 1.2 billion tonnes of CO2 in 2014, up 26 per cent since 2000. This increase is almost exclusively because of growing exports of fossil fuels. 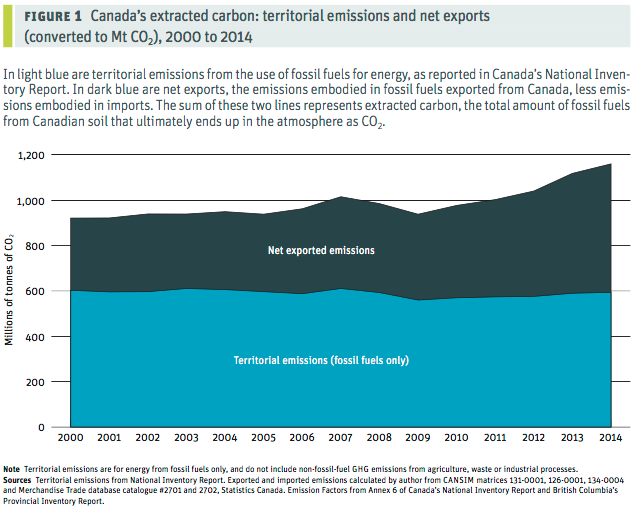 In 2014, the total amount of emissions embodied in Canada’s total exports of fossil fuels was slightly larger than all of greenhouse gas emissions that occur within Canada. The major story is that Canada’s exports of crude oil have surged (mostly from the oil sands), while imports have declined. Net exported emissions (exports less imports) from crude oil were more than five times higher in 2015 than 2000. The Paris Agreement is thus a “good deal” for Canada because only half of the fossil fuels we extract get counted in our greenhouse gas inventory. The remainder is exported and counted where it is burned. Exported emissions might not be a problem if the commitments made by countries in the Paris Agreement were enough to keep global warming below 1.5 to 2 degrees (above pre-industrial levels – about 200 years ago). Unfortunately, this is not the case. Even if all countries live up to their pledges it would lead to a catastrophic 3 degrees of warming. The problem with new fossil fuel infrastructure projects is that they lock us in to a high-emissions trajectory for several decades to come. If countries were to take the science behind the Paris targets seriously, there is a finite amount of carbon that can enter the atmosphere over the next few decades. This is called a carbon budget. What would Canada’s plausible share be of such a global carbon budget? Based on our share of global fossil fuel reserves, Canada could continue to extract carbon at current levels for between 11 and 24 years at most (the smaller the carbon budget, the less the damages from climate change). This means a planned, gradual wind-down of these industries needs to begin immediately. Plans to further grow Canada’s exports of fossil fuels are thus contradictory to the spirit and intentions of the Paris Agreement. Growing our exports could only happen if some other producing countries agreed to keep their fossil fuel reserves in the ground. The problem with new fossil fuel infrastructure projects—like Liquefied Natural Gas (LNG) plants and bitumen pipelines—is that they lock us in to a high-emissions trajectory for several decades to come, giving up on the 1.5 to 2°C limits of Paris. Canadian efforts to address climate change must consider supply-side measures, such as rejecting new fossil fuel infrastructure and new leases for exploration and drilling, increasing royalties, and eliminating fossil fuel subsidies. There is still time for to live up to our Paris Agreement commitments. Canada’s exports of fossil fuels do not need to drop to zero immediately, but nor does it make sense to pursue policies that further ramp up fossil fuel extraction. This post was produced as part of the Corporate Mapping Project (CMP). The CMP is a six-year research and public engagement initiative jointly led by the University of Victoria, the Canadian Centre for Policy Alternatives’ BC and Saskatchewan Offices, and the Alberta-based Parkland Institute. The CMP is supported by the Social Science and Humanities Research Council of Canada (SSHRC).